Join the discussion on our forums! 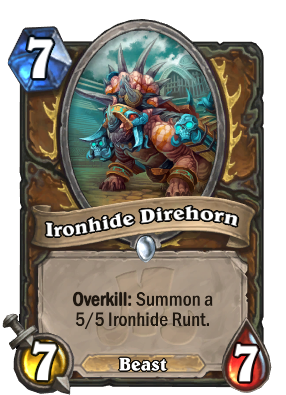 Come discuss Ironhide Direhorn over in our dedicated Ironhide Direhorn discussion topic. Well, synergy happened, but it's still rather mediocre. Either way, it's good to have a big beast for when Un'goro rotates. A boring arena card, and I dont get the flavor. Maybe they want to fool us before they drop the real OP druid cards?! Horray for unfun cards! In a class where Mill Druid was a thing, I'm not surprised. this is a terribly designed card. Its such a win more card, and, on top of that, its bland. Is it good? Probably not. Is it fun? Heck no. This card screams "win more" at the top of its lungs all day long. As we learned from Vicious Fledgling, win more cards just make the opponent feel helpless, and that's really not fun. Possible synergy with Jungle Giants and Star Aligner. Very nice if recruited out or given rush somehow. Also interesting to possibly see Beast Druid come back. Not too bad. 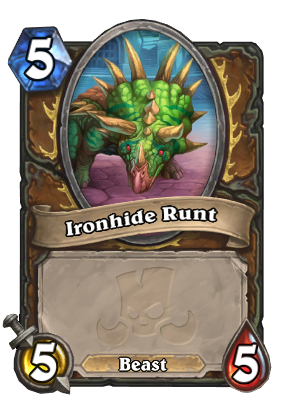 Can now be given Rush with the new card Stampeding Roar. Great synergy. so basically a War Golem...unless of course Druid suddenly gets so major cost reduction for beasts that allows midrange palys I don't see it happening. Probably neat in arena though. If this lives a turn you basically win, right? Gotta mash the baby's food extra hard, it doesn't have all its teeth yet.